I love being in the third grade. Most everything I love about it connects to how I feel about my homeroom teacher, Sister Irene Mary. She’s noticeably younger than the other nuns and she has a smile that almost fills her whole face. I like the way she places the palm of her hand on the top of my head when she greets me in the morning. She doesn’t mind it when I carefully touch the wooden beads and metal links of the rosary that hangs from her slightly defined waist. People call her, kind. Because they say that about her, I settle in my mind exactly what that word means. I hope people say that about me too, someday. Sister Irene Mary makes everything memorable, especially on Friday afternoons like this one. 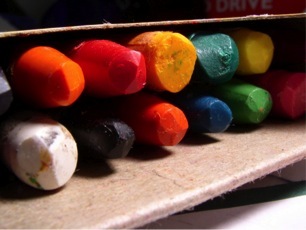 She walks up and down the rows, handing each one of us a box of crayons and a blank sheet of white sketching paper. The crayons in the boxes don’t resemble what you typically find in a Crayola eight-pack. Instead there’s a random assortment of colors. Some have strange names like, magenta, bittersweet, sienna and chartreuse. Whatever colors are in my box, I know no one else has the exact same ones as me. I’m beside myself with anticipation. Sister Irene Mary transforms from homeroom teacher to master-storyteller. We become a room full of enthusiastic illustrators. She reads us a story about Jesus and it’s our assignment to bring him to life with the crayons in our boxes and the papers on our desks. I put the final touches on Jesus’ beard. Today, it’s outlined in dark purple and filled in with red. I evaluate my work and believe his beard provides a fitting contrast to the chaotic blue waves I have swirling around him. I’ve colored my Jesus strong, confident, and brave. I don’t ever want to be afraid like Peter. I want to be like Jesus. So I’m going to keep my eyes on him. I’m eager to share my work with the rest of the class. Sister Irene Mary finds something wonderful to say about everyone’s Jesus. It’s my turn. She is over-the-top with praise and everyone in the class applauds super loud and long. I am flushed with delight. They love my Jesus as much as I do! I love being in the third grade. I love Sister Irene Mary. I love knowing it’s a big deal to take whatever I am given today and use it to color Jesus for others to see. Sounds like Sister Irene Mary was a wonderful teacher. Great post! Yes – Laura she was. She colored a beautiful Jesus every day with her life. I’m grateful for what God taught me through her!